​of the correct Lorentz pump system. Lorentz solar powered pumps utilize the DC input from the PV solar array and supply DC power to drive the motor. The controllers have inputs for water level both in the bore and for tank filling. ​Pump protection is also inbuilt. Engineered in Germany to suit our harsh Australian conditions. Manufactured from high quality​ non-corrodible materials. Pump controls and electronics located above ground in a IP65/NEMA 3A corrosion resistant housing. 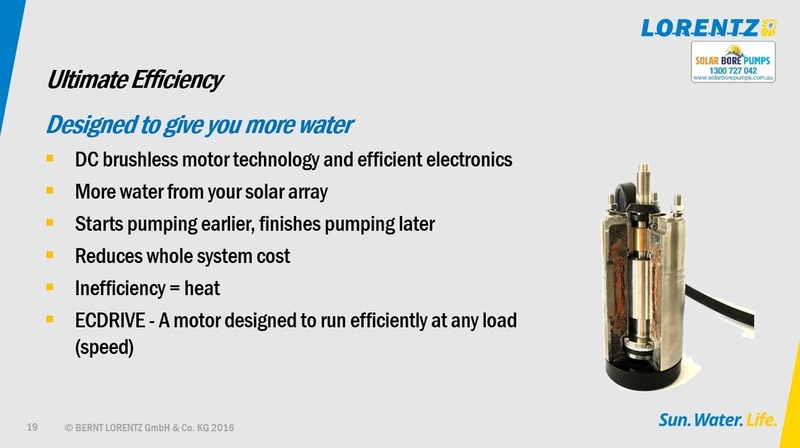 ECDrive DC Brushless motors, specifically designed for solar operation with up to 92% efficiency. Monitoring and management via Android smart phone App with integration of Lorentz pump MANAGER. Solar energy from the sun can be converted to electrical energy through the installation of a DC Power Photovoltaic solar panel array. The DC power produced by the panels can then be fed to a pump controller to power a submersible water bore pump. The pump controller matches the available power from the panels to the output of the pump as conditions and power outputs constantly change throughout the day. ​install it for you - in most areas. ​Multi-stage centrifugal pumps have series of impellers arranged on a common shaft through the centreline of the pump. Each impeller draws water through it’s eye and discharges radially as the motor spins the pump. Water is channeled from the discharge of the impeller to the eye of the next impeller increasing the pressure at each stage. A housing or bowl holds each individual impeller or the impeller stack depending on design in alignment and is part of the interchange of water from one stage to the next. Centrifugal pumps are restricted to a minimum speed to maintain efficiency and are suited to high volume outputs. ​​Helical Rotor pumps are constructed with a hard stainless steel rotor shaped like a smooth cork screw, fitted into a rubber stator with a similar shape. As the rotor turns water is drawn in and squeezed out from the discharge end of the pump assembly. This type of pump is very efficient at low shaft speeds, low volumes and is also suitable for high head applications. Lorentz PumpScanner is a free downloadable App for Android phones and tablets. It is used by the pump technician to quickly configure the pump system and register the pump for warranty purposes. ​We set the pump up prior to despatch ensuring the setup is complete before it arrives on site. The end user can also use PumpScanner to view live and historic data from the pump. This is a website that is proudly owned and operated under Town & Country Drilling Services Pty Ltd. All content on this site is protected under copyright law 2014 and is owned by SolarBorePumps.com.au and/or other associated companies. Town & Country Drilling Services' head office is located in South Australia. 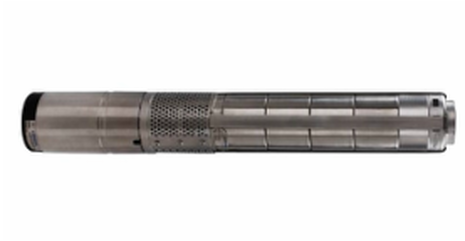 Check out our submersible bore pump BLOG here. Website Design by CorpMentis.com.